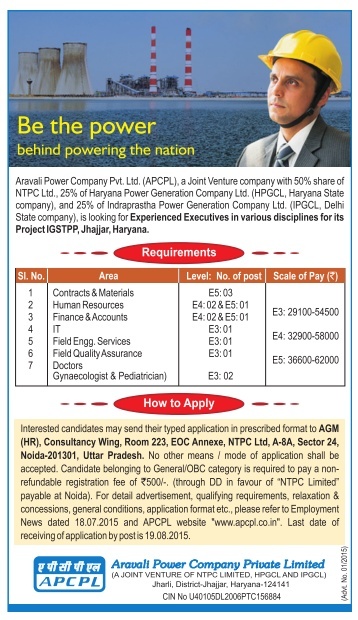 Aravali Power Company Pvt Limited (APCPL) invites doctors for Walk in Interview for the post of GDMO (Ad-hoc) for its hospital at IGSTPP, Jharli, Jhajjar (Haryana). The Walk in Interview scheduled to be held on 22nd September 2017. Educational Qualification: Qualified MBBS with valid registration from Medical Council of India / State Medical Council. Candidates to bring their personal details, 2 recent passport see colour photographs, self-attested copies of educational qualification, proof of DOB and experience certificate (if any). Original documents must be earned for verification. Interested candidates may send their personal details in advance through e-mail. Date, Time of Interview and Venue -> 22/09/2017 at 10 AM to 4 PM. The Venue at IGSTPP Hospital, APCPL Township, Jharli, Jhajjar - 12414. 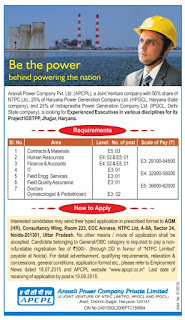 Aravali Power Company Private Limited (APCPL) - A Joint Venture of NTPC Ltd, HPGCL and IPGCL is looking for Experienced Executives in various disciplines for its Project IGSTPP, Jhajjar, Haryana. The last date for receipt of applications is 19th August 2015. About: APCPL, a Joint Venture company with 50% share of NTPC Limited 25% of Haryana Power Generation Company Limited (HPGCL, Haryana State company), and 25% of Indraprastha Power Generation Company Limited (IPGCL, Delhi State company). Application Fee: A Non-refundable registration fee of ₹ 500/- through DD in favour of "NTPC Limited" payable at Noida. How To Apply: Interested candidates may send their typed application in prescribed format to AGM (HR), CONSULTANCY WING, ROOM 223, EOC ANNEXE, NTPC LIMITED, A-8A, SECTOR 24, NOIDA-201301, UTTAR PRADESH on or before 19/08/2015.